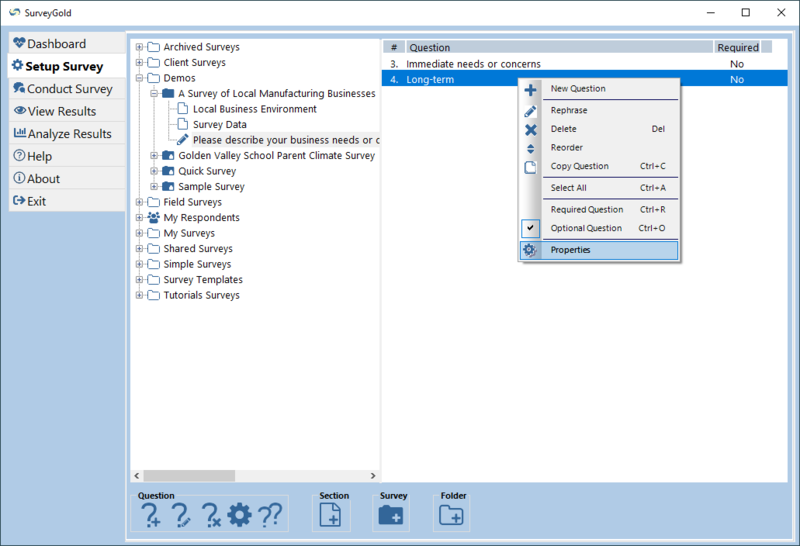 The SurveyGold Application: Intuitive. Powerful. Versatile. The SurveyGold application is the centerpiece of the solution. Install the application on your computer and use it to manage all your survey activities. Designed for the occasional survey author, SurveyGold guides you through the process of creating and conducting your survey with features that help you get the results you want, quickly and easily. Use the dashboard to track the pulse of all of your survey activity. A clean, easy-to-use dialog enables you to manage responses for all of your surveys. Quickly and easily enter responses and comments from paper-based or over-the-phone surveys. You can schedule to call back respondents you contact via the phone. Run your survey as a stand-alone kiosk to allow respondents to enter responses directly via touchscreen via a tablet PC. Instantly view your survey responses in full-color charts or tabular listings. Rich data manipulation features allow you to filter respondents or drill down to see a list of respondents who provided a particular response. Publish professional-looking Microsoft Word™ and online reports. Grade exams with ease. Export results to other tools via Excel™, SPSS™, HTML and text data formats. Quickly and easily create and distribute online surveys via your website or ours. Customize using your logo, colors and fonts. White label for your brand. Enables a respondent to directly interact with your survey via a touch screen. Perfectly suited for use with a tablet PC. Interview respondents and record responses even while the surveyor's computer is offline. Create and conduct paper surveys. Engage a network of colleagues who conduct surveys in-person, in the field, and submit responses back to you using their mobile device. Conduct the same survey via any or all methods and collect all responses into a single set for viewing, analysis and reporting. 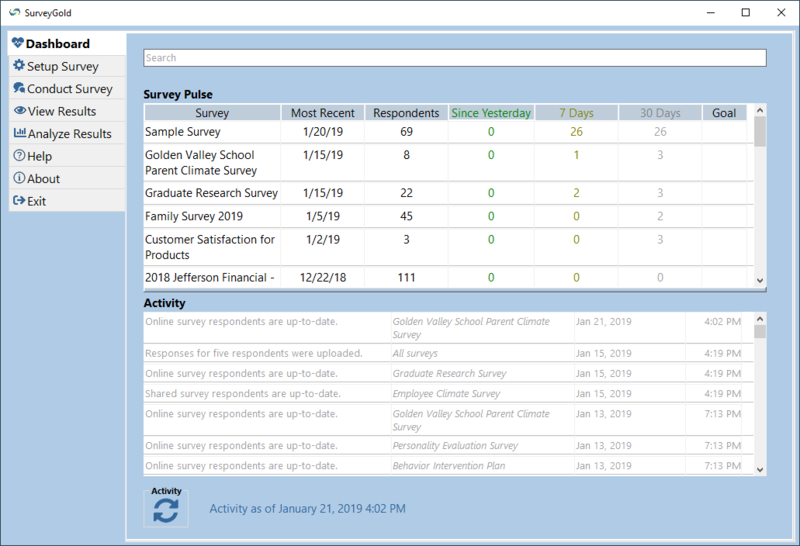 Share any or all of your responses with others making it easy for everyone to view and report on survey results in real-time. Visually and intuitively navigate survey results using charts and tabular lists. Drill-down to view progressively more detail. Produce cross-tab charts, banner tabulations, weighting index and code responses for qualitative analysis. Publish in Word, HTML and PDF formats. Define subsets of survey respondents based on responses and/or a date range of responses. Use filtered respondents for viewing, analysis and reporting. Convert responses to other file formats to take advantage of other data analysis software tools you have. Designed for the occasional user to be productive without a huge learning curve. Tutorials and responsive customer support are available to help. SurveyGold uses TLS encryption, the same security that banks use. Your data is protected and validated by TrustGuard. Our servers are PCI compliant.